Gutters are all we do. Too often in this industry you find companies that do everything from windows, to basements, to roofing, to porches. Not us. We are the experts in gutters, because that’s all we’ve focused on for over 20 years. Seamless 5" aluminum K Style gutters for residential homes with over 30 colors to choose from. Seamless 6" aluminum gutters for commercial buildings and larger homes with 20 colors to choose from. 7" box gutters made for buildings with flat and sloped metal roofs. Available in four unique colors. 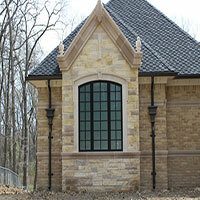 Copper and half round gutters with downspouts - a perfect way to add curb appeal to any home or building. Minimize maintenance and maximize the life of your gutters with our Gutter Guards, Gutter RX, or Xtreme Gutter Guards. 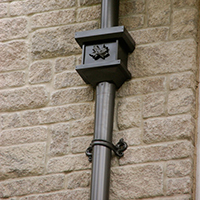 Our gutter accessories add elegant architectural detail to your gutters that are both decorative and functional. No one likes to be forced into a decision driven by high pressure sales tactics and ‘today-only!’ pricing. These sales pitches seemingly go on for hours, at your kitchen table, making you feel like a prisoner in your own home. We simply measure your house, suggest the optimal solution and leave you with a competitively priced written quote. Most estimates take less than 20 minutes. Also, we offer straight-forward pricing. No Gimmicks. We know our customers are intelligent enough to recognize gimmicky sales pitches like “Buy-one, Get One-Free!” or, “Free Gutters with purchase of our overpriced Gutter Guards”. We value your time and will always offer you our best price possible at the time of the estimate.